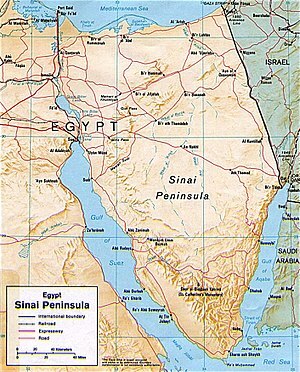 A new Egyptian crisis arena: the Egyptian and Israeli armies Friday, July 5, raised their alert levels on either side of the Sinai border after the Muslim Brotherhood declared Sinai its center of revolt and revenge for the Egyptian army’s ouster of Mohamed Morsi as president Wednesday, July 3. Following a multiple Islamist attack in northern Sinai, the Egyptian army went on high alert in the Suez and North Sinai provinces. The Sinai border crossings to the Gaza Strip and Israel were closed. The army spokesman in Cairo denied declaring an emergency – only a heightened alert. Israel has imposed a blackout on news from this tense region, but DEBKAfilereports reinforcements were sent in Friday to boost the IDF units standing ready along the Egyptian border. Egyptian forces also shut down all three underground passages running from the mainland to Sinai under the Suez Canal. Egypt’s Third Army was deployed to secure them, under the command of Maj. Gen. Osama Askar. Further measures imposed for guarding Suez Canal cargo and oil shipping against possible rocket fire from central Sinai included the stationing along its banks of Patriot anti-missile batteries and anti-air weapons systems, according toDEBKAfile’s military sources. Around one-third of the world’s oil supplies from the Persian Gulf pass through the Suez Canal on their way to the Mediterranean and Europe. These emergency measures were clamped down Friday after the Muslim Brotherhood established a Sinai “War Council” to mount a rebellion against the army in collaboration with the radical Palestinian Hamas and Jihad Islami as well as the al Qaeda-linked Salafist groups in the Gaza Strip and Sinai. The ousted Muslim Brotherhood’s strategy is seen by intelligence sources as designed to transform the Sinai Peninsula into an area of revolt and a base for attacking Israel. They are counting on the army having its hands too full with maintaining security in the mainland cities of Cairo, Alexandria and the Nile Delta to have troops to spare for Sinai. They intend to demonstrate that the military are incapable of at one and the same time fighting the Egyptian people, defending Western shipping in the Canal and Gulf of Suez and preventing attacks on Israel. The new Sinai War Council set up by Morsi’s followers released a video tape threatening that “rebel’ forces would target any army and police personnel found in Sinai in retribution for the military coup. The new Islamist coalition launched its “revolt” Thursday night, July 4, by firing a couple of Grad rockets at Eilat. They exploded harmlessly outside Israel’s southernmost town. Israel’s military spokesman has drawn a curtain of secrecy of the event. However, the IDF’s Adom Brigade and its three sub-units, along with the Gaza division, were known to have been placed on high alert. The Islamist Sinai War Council struck again Friday morning, with a multiple attack by Salafist gunmen associated with Hamas and Jihad Islami in northern Sinai. They fired rocket-propelled grenades, mortars and heavy machine guns at Egyptian military intelligence headquarters in northern in Rafah and El Arish airport as well as several Egyptian military and border guard facilities. Our sources report they attacked in wave after wave, the gunmen shooting from heavy machine guns and rocket launchers mounted on minivan as they raced around. Army helicopter gun ships were finally brought in to halt the assault. No word on casualties or the scale of episode has been released.